I admit that initially I was hesitant about attending the 2013 World Parkinson Congress here in Montreal. I wasn't sure that I wanted to see, hear, and talk about Parkinson's disease for four straight days. While there is no denying that PD is a constant companion, I try to make it a silent partner. Then too, I was afraid to see how much PD had advanced in friends I haven't seen in several years. More to the point, I was afraid to look into their eyes and see the reflection of how they think I am doing, knowing that even the smallest detail doesn't go unnoticed among those on our shared journey. My fears disappeared, however, as soon as my husband and I arrived at the convention center. There, at top of the escalator, stood a group of friends from far and wide ready with big hugs, stories of their trips in, and much laughter. It was like walking into a class reunion, only better. We quickly reassured ourselves and each other that we are all doing well. Had we planned to meet at that very spot at a set time, it never would have happened… not with 3,300 people from 70 countries registered for the Congress. 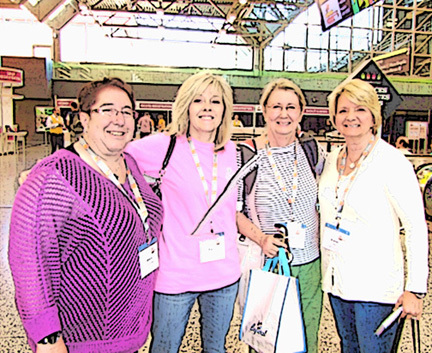 Walking around the convention center, I realized how many people I've come to know over the 15 years since my diagnosis — many who have helped me see my way through some of my darkest times, and others who were kind enough to stop me and tell me how my stories on http://www.pdplan4life.com have made a positive difference in their lives. Who can ask for more than that? Life is all about "paying it forward."